Dividends tend to rise faster than inflation, and that could become their most attractive feature if the value of the pound and the interest rate on savings keep falling. 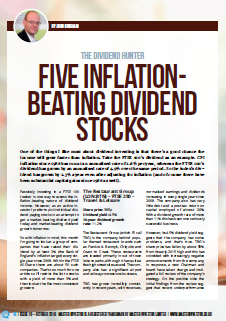 With inflation in mind, I decided to focus my latest article for Master Investor magazine on a handful of UK stocks that combine a decent dividend yield today with super-consistent and inflation-beating dividend growth. The five companies in question are The Restaurant Group, Sky, Stagecoach Group, British American Tobacco and Capita. What I learned from analysing them is that – unsurprisingly- very few stocks can combine consistent past growth with a decent dividend yield today and bright future prospects. Most of those five companies have problems of one sort or another, although having said that, I do hold The Restaurant Group and British American Tobacco in both the UKVI portfolio and my personal portfolio. Very nice article, I agree with you take on things and also with the conclusion, because to be honest with you I’d probably consider RTN but not the others. I have seen that you did not include GNK (Greene King) which is in my PF and I believe it has a good potential to weather the inflation linked issues that the UK might suffer in the future (plus they will benefit from the extra income coming from tourists that will visit the UK now that the pound is weak) . Thanks as usual for sharing! Hi Stal, Greene King has definitely produced inflation-beating dividend growth, but the main reason it wasn’t on the list is that its revenue and eps growth has been a bit lacking over the last decade. Also, I’ve avoided the company as an investment because it has a lot of debt. Previously debts were about £1.5bn when earnings were about £0.1bn (so debt was 10x earnings) and now debt is £2.4bn after a major acquisition last year, while post-acquisition earnings have jumped to about £0.2bn (so debts are still 10x earnings!). Of course that’s not to say it couldn’t be a good investment. If those debts don’t become a problem and if the acquisition works out well you could be onto a winner, so I wish you luck with it! Debt was something that I did not like in GNK but the business model and the product that they sell it’s something that in the UK could be almost assimilated to consumer staples. I was interested in that mainly, also considering that foreigners are going to come.to England more and they will likely consume products in GNK pubs. On debt/earnings an increase of 50℅ of the debt gave a 100℅ increase in earnings, that’s not that bad after all, but I agree that they need to reduce the amount more aggressively. More generally speaking, which UK dividend paying companies have little or no debt right now? If The Restaurant Group hasn’t got debts, who has then? The Restaurant Group is riddled with debt, because of the many leasing agreements it signed. One of my clients owns a 50% share of one the premises leased to this company for a Frankie & Benny restaurant. The leasing contract is so disadvantageous to Restaurant that they cannot close it down and only pay the rent due till the end of the contract. There are still 12 years to go on the lease, increasing by RPI + 1% each year. So the Restaurant can only lose money on that location, they have little clients from time to time, not covering even the wages. As a company, the problem they have encountered is a change in habits for their clients, who seem to stay more at home playing on their iPhones and iPads and eventually order food online. Competition from other outlets that are new and offer a better experience is also a cause. I was in a Frankie last year, but it is not going to happen again as the experience was awful. For your sake I hope the investment may turn round but with Brexit looming, I would not bet on it. Myself I prefer the country pubs who serve local produced food. 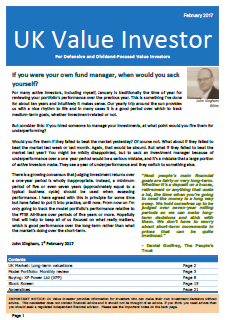 I have a client who came to me for financial advice, but decided to use his investment manager of many years for discretionary management of his portfolio. He had Restaurant Group in his portfolio and I forced the investment manager to sell the stock, saving my client some money. Hi Eugen, currently I don’t count lease agreements as debt (i.e. I don’t capitalise them, to use the jargon). In my experience they’re much more flexible than borrowings when times are tough and don’t pose the systemic threat that borrowed money can. When a company gets into trouble and breaches its loan conditions (or covenants), lenders can force a rights issue, asset sale or all manner of other things. That simply isn’t the case with leases (in my experience). What typically happens with leases is that any underperforming sites are closed and the company buys its way out of the lease, or the lease is renegotiated. This is done on an individual basis and is unlikely to affect a significant number of sites if the company is fundamentally sound and has a geographically diverse range of locations. I don’t want to rule out a whole class of companies such as retailers just because they lease the vast majority of their stores, and all of the retailers I’ve invested in have done very well (so far). My supermarket investments have performed badly, but that was for other reasons like large debt and pension obligations rather than lease obligations. I could of course be wrong about leases, so if I do end up investing in a low debt retailer which then runs into problems because of its lease model then I might decide to start capitalising leases, but until then I’ll continue to focus on other factors instead. As for TRG specifically, we’ll just have to wait for a few years to see how it does, and then I can pick apart my decision to buy it with 20/20 hindsight. Was very interested to read you comments on Capita and TRG, both shares I’ve looked at recently but come to slightly different conclusions. For me Capita was the pick, I managed to pick it up the day after a 26% share price decline, certainly risky but I thought the risk could pan out. My analysis process (shamelessly copied from what you set out in your book) identified the high debt (although I only see debt as £2612.1mn of overdraft and financial liabilities, which is 6.6 times average adjusted earnings of the past 5 years) and of course their obsession with acquisitions – they boast in the annual report that they’ve made 130 acquisitions since 2006! However based on their history they seem to have a decent process for integrating these acquisitions into the company, I was willing to overlook the high debt due to their perfect history of EPS and DPS increases over 10 years. Also, their more immediate problems (dispute with the Co-Op, contract penalty of 20-25mn that needs to be paid to TFL and a possible Brexit-induced slowdown in sales pipeline growth) seem to be all relatively temporary issues that should be resolved over a 3-5 year minimum holding period. When I looked at TRG though I came to broadly the same conclusions as you, but I was a bit more pessimistic about the outlook. They already stated in their 2015 AR that they don’t see like-for-like sales growing – i.e. the only growth will come from new restaurant openings. When I add Brexit-worries to this, since if a hard Brexit really does push the UK into recession the absolute first thing families will drop from their budgets is eating out at places like this, the outlook for TRG to me seems possibly not worth the risk. As you say, we’ll have 20/20 hindsight in a few years to see which of these companies was the better bet! I was wondering though, you already have a question in the value trap analysis about how immune a company is to commodity price fluctuations, have you considered putting a similar question in for immunity (or not) to (hard) Brexit? I’m considering adding that to my analysis process. “I was willing to overlook the high debt due to their perfect history of EPS and DPS increases over 10 years” – I totally understand that, but I’ve been down that road before with Tesco, so for me high debt companies are off the shopping list, no matter how impressive their past results. Capita’s debt ratio – The difference between my ratio of 10 and yours of 6.6 probably (I haven’t checked) has something to do with adjusted/normalised/reported earnings. I use normalised, you seem to have used adjusted, and although these are usually pretty similar I guess in this case perhaps they’re not. 6.6 is still too high for me though! “the absolute first thing families will drop from their budgets is eating out” – Not really, or at least that isn’t what happened in the Great Recession. I think people tend to either eat out less often, or go to a cheaper option. So TRG customers may eat Domino’s pizza or McDonald’s, but people who eat at “posher” restaurants may downsize to Frankie & Benny’s. Look at TRG or Dominos during the last recession and there was nary a blip in their performance, which I must admit was surprising. Although in a Brexit recession it may be different of course. 20/20 hindsight will reveal all. As for Brexit specifically, other than inflation I cannot begin to imagine how it will impact the economy, let alone individual companies. So for now I’ll continue to take my normal stance, which is to assume that the future is uncertain, and therefore I should invest in companies that I think have a good chance of performing well in a wide range of possible futures. Hopefully TRG fits that description, but only time will tell. Interesting point about the Great Recession and TRG – that their restaurants managed to hold up with no major issues. I wouldn’t have thought of it in that way but I guess it makes sense that people who eat at ‘posher’ restaurants would ‘downgrade’ to TRG in a recession. I’ll consider it again another month if I don’t find anything to buy. I see your point about adding a Brexit check to the value trap analysis. I spose at the end of the day there’s too many unknown factors to consider to decide if a company is ‘exposed’ to Brexit, so I’d end up unable to pinpoint where in the spectrum of Brexit effects from ‘mild effects’ to ‘major catastrophe’ the company will be. On Sky, don”t you think this going to get eaten I’ve by Amazon. And Netflix ? That’s assuming the ever above inflation increases in football rights don’t eat all their profits. On Capital, it’s profits have fallen every year for the last 5, whilst it’s revenue had climbed and debt has ballooned. Looks like a disaster waiting to happen, but could be wrong if the government keeps printing false money to hand these guys. I don’t really factor in any of the FANG companies (Facebook, Amazon/Apple, Netflix, Google) into any analysis. It’s too easy to say that any retailer on earth will be eaten by Amazon, or that any software company will be eaten by Apple or Google, or that any entertainment media company will be eaten by Netfix (or any transport company eaten by Uber or Tesla). All of that may or may not be true, but you could extend that thinking to anything, whether it’s insurance, pharma and who knows what else. Perhaps the FANG companies will eat the world, but I doubt it, so for now I’ll continue to ignore them. John , apologies for many typos in my first comment. On the FANG point, yes it’s possible to ignore them and imagine that UK companies exist in a protected bubble, however, that’s one of the reasons you suddenly see a collapse in your investment almost over night. There are countless examples which you are more than well aware of. Amazon and Netflix have already stolen a huge march on SKY for streaming content, it’s only just begun. Good luck with Sky though if you decide it’s an opportunity. Don’t see many of the Terry Smyth’s and the like showing an interest, although forming your own judgement is equally important. “On the FANG point, yes it’s possible to ignore them and imagine that UK companies exist in a protected bubble” – Actually I was trying to make the opposite point, that companies face a vast array of competitors which I cannot begin to (nor would I want to) contemplate. FANG are just the obvious competitors that spring to mind, and are not necessarily the most important. I don’t know who the most important competitors are, and I don’t know who they’re going to be five or ten years from now, so I don’t pay them much attention. I just stick to buying a diverse group of good companies, with proven track records, at fair prices, and expect them to outperform as a group over the long-term. To me FANG are just noise, and one of my main goals as an investor is to filter out the noise. With 4 of those companies there are a few things in the air that would stop me from investing. I have sold out of BT when my stop loss took me out and I looked again at both BT and Sky and it give me the feel that although they tried hard they are bot more than an utility company. One thing I learn earlier from a value investment house is that utilities do not present a value premia. I thought diferrent about BT and I made good profit with this stock, but in the end I realised it is still an utility stock. In my opinion Sky is also an utility stock. 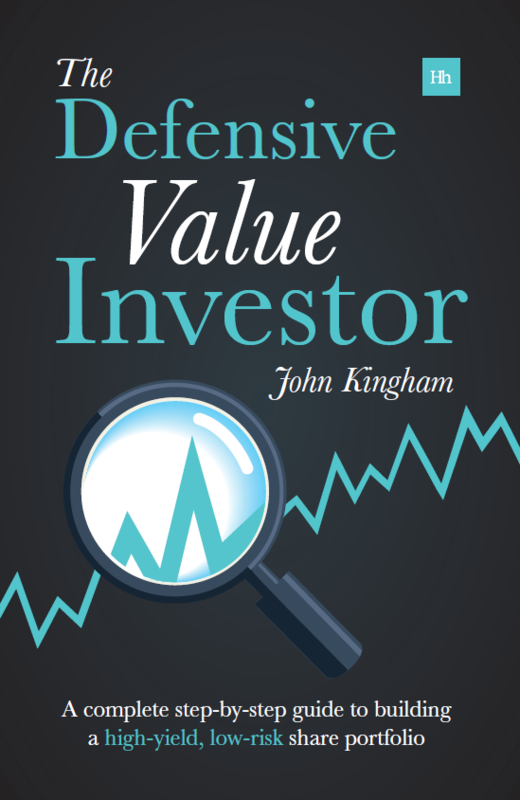 If you need to learn more why utilities so not have a value premia, you would need to contact Dimensional in the UK, they are the people who started systematic (passive) value investing and hire Fama and French. John is right that people may move to cheaper places should there be a squeeze in their budget as a resulf of Brexit. However The Restaurant Group has avoided to invest in their restaurants and they could well be avoided. I was once to one and I am not going again. There is a second thing, the cost of the personnel could well increase if no migrants would be allowed in Britain. Profits are very senzitive to wages, and cheap wages from Eastern Europe are about to stop. Is it time to sell BATS if the Reynolds acquisition goes ahead? Fortunately I’m holding Imperial and Reynolds. if the Reynolds acquisition does succeed I will be holding BAT again and will have to review offloading it with a much larger debt mountain. One thing is for sure the tobacco industry has been smoking for a long time now! OK I do apologise that was dreadful ! BAT will have higher debts but also higher assets on the balance sheet. There is debt and debt in this world. There are companies paying 7% per annum interest and companies paying 1%-2% per annum. BAT is in the second category. Myself I don’t mind leverage as long as the company has a good cashflow and it pays low interest rates. In the end, as shareholders the price we pay for a share is a discounted value of the future free cashflow. If the company leverages at low interest rate, there will be a higher free cashflow. Ene you are correct of course, however, the problem may arise when they have to role over those debts in a higher interest rate world. I still have 7% of my portfolio in IMP and Reynolds, be interesting to run some numbers on BAT if the deal completes. Maybe you have done this – I’d love to see it. Won’t have time to do it for a couple of weeks as I’m working my way down Coast of Vietnam. Increases in interest rates would always have an effect on leveraged companies, it is the nature of thd beast. In my personal opinion it would be hard to significantly increase interest rates these days as wage increases have not picked up and many financial companies and other companies (energy, mining) are still deleveraging. I spent a lot of time studying the balance sheet recession subject and we are still a long way into this. US is better overal but still the financial sector is deleveraging. UK, Japan and Europe are well behind and China has entered deleveraging last year as well. Last companies like BAT can now issue 20 years bonds at 3% per annum, puting the repayment well into the future. I will try to do an analysis of the financing package when there is more information. There is a high atraction to tobacco companies with US assets, people seem to discounted their value because of e-cigarettes etc, but they seemed to be wrong. Reynolds was my highest holding in the portfolio at 5.5%, and these days I do not like to have one holding of more than 5%. Hi LR, yes that was a truly appalling pun. As for BAT/Reynolds I think it will mess up my debt ratio metric, but I won’t be looking for the exit anytime soon. As you say these stocks continue to do very well at reasonable valuations, as long as you can stomach their somewhat unpalatable products.